WASHINGTON — Metro has ordered a private contractor to pull a bus driver off a work zone shuttle route after he was caught on camera talking on a cellphone behind the wheel. In a video posted online by Metro’s largest union, Amalgamated Transit Union Local 689, the driver can clearly be seen talking on the phone while operating a bus at the Fort Totten station Thursday morning. WARNING: Video features explicit language. In a statement, Metro called the video an “obvious and egregious safety violation” and ordered the contractor, Coach USA, to permanently bar the driver from providing service to Metro. The driver had been operating a shuttle bus, taking Metro riders around a work zone on the Red Line. Through Labor Day, riders on the Red Line need to take shuttle buses between the Fort Totten and NoMa–Gallaudet U stations. 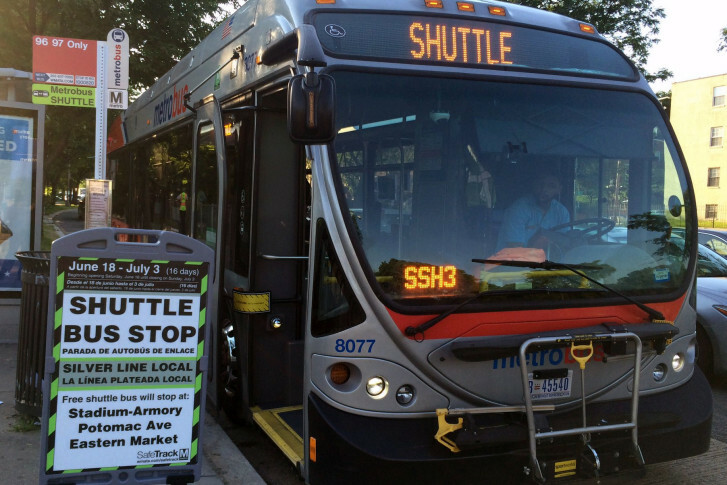 Its part of a 45-day shutdown of the Rhode Island Avenue and Brookland stations. Under Metro’s policy, train and bus operators must have their electronic devices turned off and put away while they are working or they can be fired. The union said it has challenged 16 such firings in the past, but has been unsuccessful.